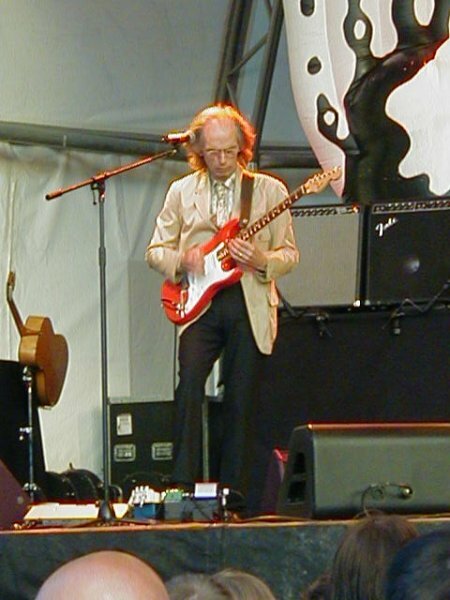 Two days after the now-famous Lugano Jazz Festival gig in Switzerland, Yes decamped in Devon, Steve Howe�s back yard, to play an open-air concert in the precincts of scenic Powderham Castle. I was living in not so far away Exeter at the time, and was rather thrilled at the prospect of seeing my favourite band almost on my doorstep, and outdoors. In the end the event didn�t quite live up to its promise, but it was still worth going � not least because I met a few Yes friends, including Brian Neeson, Alison Lancaster and Brian Lancaster from Scotland. The weather held OK, and many people arrived early to enjoy a concert. Some �very special guests� had been advertised. The band came out to do a sound check. Steve Howe didn�t look to thrilled to have an audience for this to start off with, but he engaged with the audience and graciously came out to play a couple of numbers for us while we waited. That was special. I secured a good place right at the front, though I found myself moving around during the show in order to find some of the best sound spots. The concert began while it was still light. This obviously impacted the light show. Equally, the wind made the stage set, which was rather cramped on the rig, look a little like a bouncy castle. There were some sound problems, too. 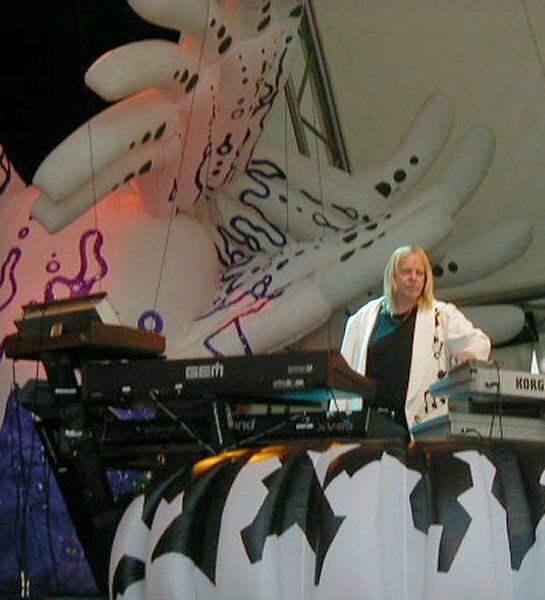 Rick Wakeman struggled a bit with his keyboard set-up, and Chris Squire was motioning for more power. He also looked a little worse for wear. So it took some time for things to gear up musically. The �Mind Drive� excerpts and �And You and I� came off well. Chris varied his solo with an older version of �The Fish�. The band played straight through rather than having a break, as they were clearly under pressure from the local outside performance regulations. Unfortunately we did not get �Ritual�, which for me is the absolute highlight of this set list. The acoustic section was also dropped. Alan White was solid behind the drum riser. Steve was on form. Jon looked a little out of it at times. Even so, it was an enjoyable day out, and some of us retired to a nice country pub on the way back to our different destinations. I was travelling by bus, so I left a little earlier than I might otherwise have done, after a bracing walk. When I got home, I found that I had caught the sun a little. Thanks to Jez for a fine set of photos, too. Much appreciated. Not one of there best concerts that i have seen,1st in 1977 & amazing.But now days they seem to be going just frew the same old motions & for the price of the tickets i expect a bit more for my money. Dont think i will be going to any more Yes concerts now days as my music tasts have moved on.Now were are my Prodigy cd's. Before 10 July 2004 I was a Yes virgin!! Just over 12 months ago I met this rather nice fella. On our first date he divulged that he was somewhat fond of a band called Yes. For �somewhat fond� read: been an avid fan since the 70�s, possess everything ever recorded by and about them, visit website daily, not to mention the concert-going� you get the picture. I�d searched my aging brain cells and asked if they�d ever had a keyboard player called Patrick Moraz? �You�ve heard of Patrick Moraz!! ?� he replied. OK I can hear the purists screaming �not classic line-up� but hey it was a start. They say the way to a man�s heart is through his stomach, how little do they know! 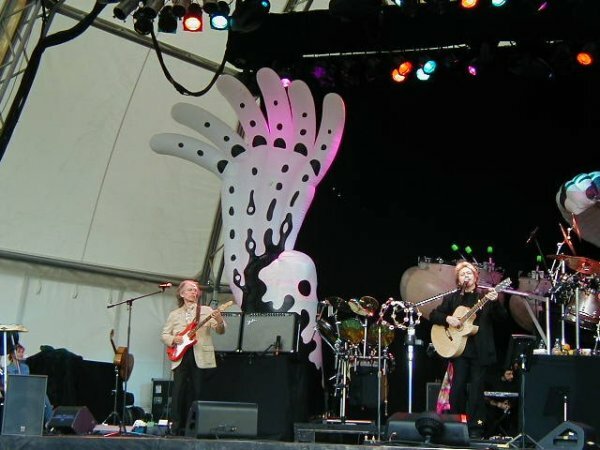 Over the next 12 months he gently introduced me to the world of Yes with quite a bit of flirting; listening to CDs, watching DVDs� all those interviews with band-members, I felt I was getting to know the guys quite well. Then some actual foreplay; a visit to Music Live at the NEC (Steve Howe acoustic set and electric demo) and a Steve Howe concert in Manchester�wow!! So with appetite whetted, flames of desire well and truly fanned, my lovely fella enticed me down to Devon to finally lose my cherry. Wearing a Yes 35th Anniv t-shirt (purchased by said fella at the Mancs gig) we settled on a suitable spot (just left of sound-stage) and I tried to blend in with the experienced Yes nerds� oops sorry, fans, hoping my virginity would not be spotted. To this end I had been tasked with learning the lyrics to ISAGP and YIND. Forfeit for failure� no Devon cream tea!! (How mean can some people be!?) 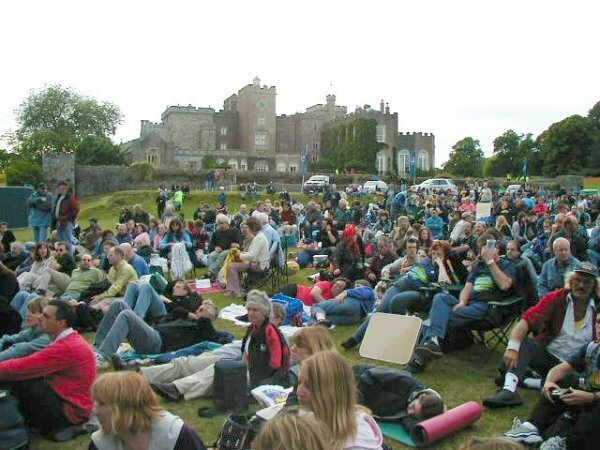 But a look round the assembled gathering confirmed just how serious Yes aficionados are; many with arms crossed, feigning nonchalance, listening with bat-like critical concentration. �They don�t look like they�re enjoying it very much� I thought to myself as I clapped and bopped away happily. I know you probably couldn�t give a flying-robotic-drum-beat about what I thought of it so I�ll keep it brief. 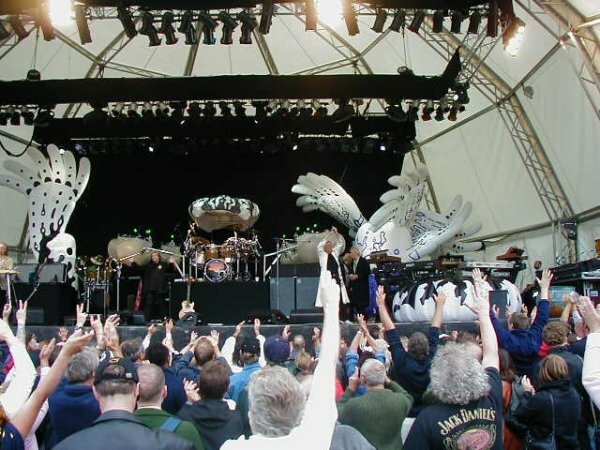 I was a bit disappointed with the stage set (having, of course, seen Roger Dean�s design concept on the website!!) but then again lighting effects aren�t great in daylight. Even in my extreme naivety I noticed they took some time to sort the bass levels. It was a shame that the much-hailed acoustic set was dropped, especially in view of how well Steve�s solo came across (�tour weariness probably� I was told) and I was really looking forward to Ritual, as it�s one of my fave tracks. But all in all I had a great time, the combined musicianship of the band is stunning, I loved the solo section and a real highlight was AYAI. Steve dazzled me with his brilliance, Jon made me feel warm and fuzzy, Alan drove the whole thing along and Rick wooed me with his romantic twiddly bits. And the climax? Oh Chris�definitely Chris! The places his bass reaches I just can�t say (blush). The 'bouncy castle' set looked very much worse for wear. The centrepiece was hoisted to the top of the stage and obscured by the lighting rig, so I couldn't quite see the point of having it. The rear section behind Rick was held up on bits of string and looked like a very poor Gerry Anderson puppet. 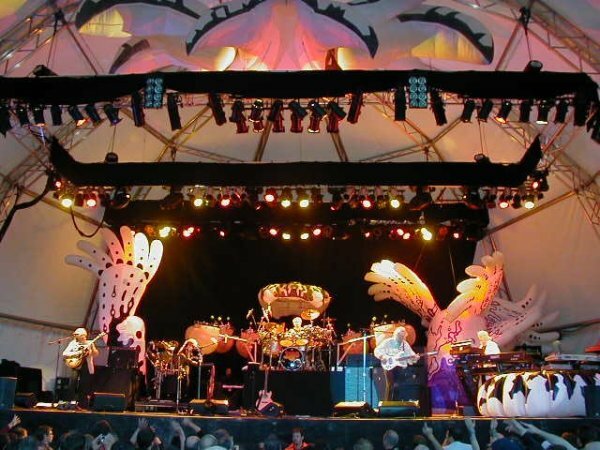 In any case, since Yes were coming on in the light and ending at dusk, lighting and effects were not going to form a great part of the show. At 7.30 (ish) Firebird Suite announced the impending arrival of Yes. All the picnic tables and chairs, smoked salmon, wine, celery dips (yes honestly) and cheese and pickle sandwiches were hurriedly put away and the (sizeable) crowd surged, or perhaps limped in some cases looking at the age of them, towards the front (where me and chum had already staked our claim). Opener was GFTO, followed by Sweet Dreams performed in a perfunctory, if not vibrant way. Chris looked old. Very old. Rick looked bored. Steve was enjoying himself, Jon was in a world of his own and Alan propelled the whole thing along with gusto as usual. Chris clearly wasn't happy with his bass sound and kept making faces at his techie and the cabinets behind him, and he didn't really wake up until SSoTS, when he noticed a familiar face in the crowd, to whom he played for the next hour or so. The aforementioned friendly face, was, we believed, Nick Beggs, bassist with Kajagoogoo, who seemed to really get off on the whole Chris Squire thing. As did we! Yes had moved up a gear for Mind Drive and SSotS. YinD got another airing, as did All Good People. I didn't make notes, so this isn't in any real order. Steve also struggled with guitars and his sound deserted him during YinD. he later told us it was his volume pedal at fault. Meanwhile, Rick looked bored, Alan thundered away etc etc. With no acoustic set, it was a bit of a surprise to hear Long Distance Runaround, which was follwed by a familiar ending leading into.......no, surely not.....yes, The Fish, in all its glory. Chris really came alive. It was an older arrangement without the 'Whitefish' segment but with a sizeable chunk of Silent Wings for good measure. What a surprise that was, and it went a long way towards making up for the truncated setlist. We were also treated to Clap, which led into a Wakey solo, during which Rick woke up at last aswell. It was a piece from 6 wives, virtually in its entirety and was a real treat. So what else did we get? Well, we had AYAI, after which Jon thanked us for LISTENING to it. And what a superb version it was. We had Starship Trooper as the last songe, then the bad took a bow, pretended to leave the stage and then came back for an elcetric version of Roundabout. Talk about going back in time! No encore, except Roundabout was really the encore, but without the band leaving the stage. Saturday morning, 8.30am ,leaving shortly for a day of it, weather seems to be holding, lets hope it stays that way! Wot happened to Summer?? sorry hugh. I totally forgot all about that one. Silly me. 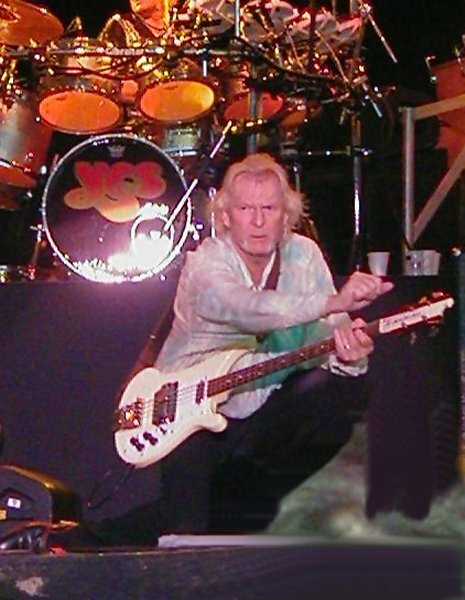 YES played at the Glastonbury Festival 2003. Wasn't that outdoors? Whatever, hope the weather is kind to all you (lucky) people going. I am travelling down from South Wales by train on the friday before the gig. Me and my girlfriend are staying at a pub in Starcross. Looking at today's weather in the daily mirror, it doesn't give a good weather forcast for this coming saturday. I really, really hope it doesn't rain. Yes seems to be cursed with our bleedin weather. Their Stoke gig in 1975 had to be abandoned during their set because of rain, and then reading rock festival 1975 when yes headlined it rained also. 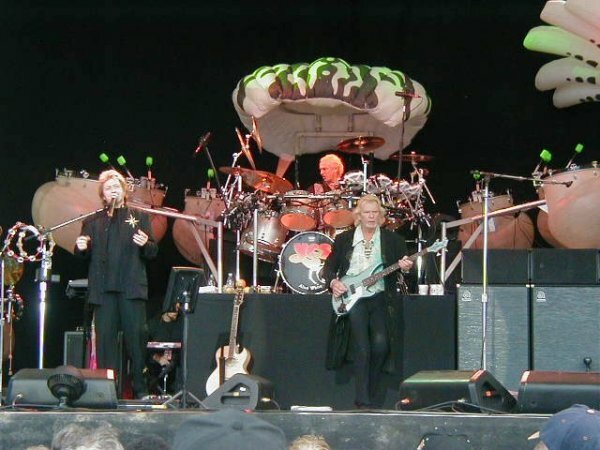 Believe it or not, that was Yes's last outdoor gig in the UK. They haven't done one since. I am taking my wife and my 3 children to this show. It will be the first time for my kids at a Yes Show, looking forward to it. 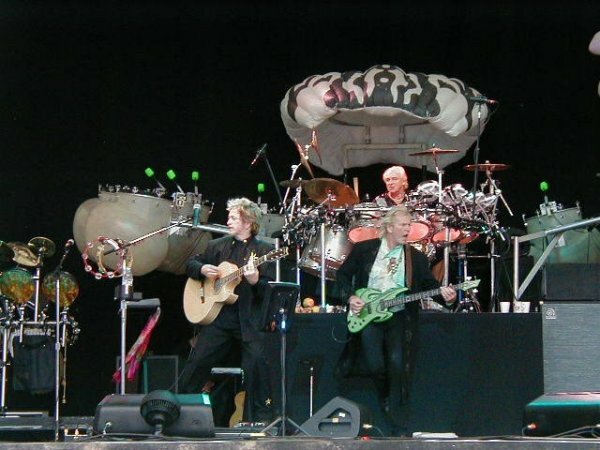 I've never seen Yes in the open air, so as long as the weather holds out, this should be great!